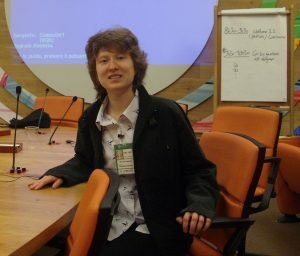 Grantham Scholar Magdalena Matysek has been in Rome this week to present at the UN Food and Agriculture Organisation’s Global Symposium on Soil Organic Carbon. The event began on Tuesday and closes today, with up to 500 delegates from across the world meeting to support ending hunger and malnutrition, climate change adaptation, reversing land degradation, and sustainable development in general. Yesterday, Magdalena presented on the topic, ‘Effects of a raised water table on CO2 and CH4 soil emissions and celery yield from agricultural peat under climate warming conditions’. This followed research published earlier this year by Magdalena’s PhD supervisor, Dr Donatella Zona, which showed that increasing the UK’s water table could help to slow down global warming, boost crop yields, and preserve peat soils.